Why does one of these eggs not match the others? 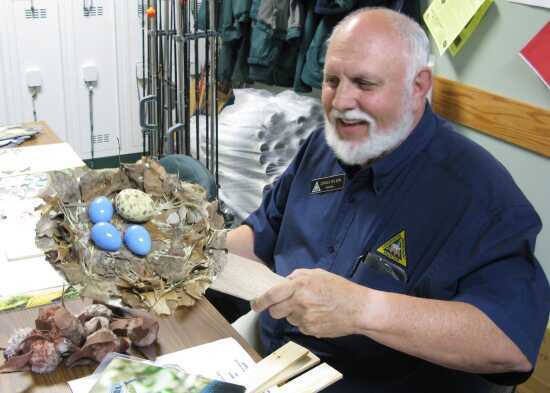 Charlie Wilson, a naturalist and volunteer with the Cape Girardeau Nature Center, displays a crafted woodthrush nest that will be used in activities at the Migratory Bird Day, Saturday, at the Nature Center. Wilson said children and adults alike will learn about the trials endured by migratory birds. One lesson they'll learn is what bird lays it's eggs in other bird's nests, like in this photo. Migratory Bird Day is Saturday from 9 a.m. to 4 p.m. with live bird banding to begin at 7 a.m. The World Bird Sanctuary will also be flying live birds at 11 a.m. and 2 p.m. For more information call the Nature Center at 573-290-5218.